Personalized Bic Pens in Bulk. Promotional, Inexpensive. Budget Prices for USA, Canada. Fast Production. 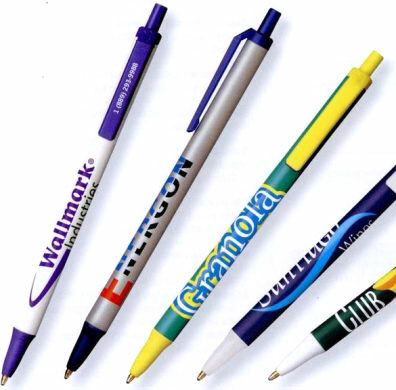 Bulk Bic pens - "Clic Bic" pens, custom imprinted with your logo or message. The renowned, high quality Bic pen is the most popular promotional pen. Budget Prices in USA and Canada for wholesale customized Bic pens. You may choose from hundreds of possible combinations of barrel and trim (clip and tip) colors. Free artwork design. American clients pay no taxes, Canadian clients don't pay PST. We will send you a proof for your approval before production. Prices include a 1 color, 1 location screen imprint. Additional Imprint colors : Add $0.11 per pen, per color Set up charge is $25.00 per color. Individual cardboard gift box: add $0.15 per pen, inserted. Long lasting refill: enjoy over 1.2 miles of writing ink. Barrel Color: white, silver, black, light blue, burgundy, green, orange, clear, cream, forest green, navy blue, purple, red, teal, yellow, pink. Trim (Tip and Clip) Color: black, red, navy blue, light blue, burgundy, forest green, medium green, orange, clear, cream, purple, teal, white, yellow, pink. Imprint Color: any of our many stock colors, please specify. Exact PMS match costs $32.00. Barrel Imprint Area: 2 1/8" x 3/4"; 1 Color is Included. Typical Production Time: 5 days after artwork approval; 1 day rush production is available: contact us. Standard Packaging: bulk, 500 pens per cardboard box.